Background: Apoptosis is one of the pathways of programmed cell death (PCD), which leads to pathognomic cellular changes different from cellular necrosis. It includes the death receptor pathway and the mitochondrial pathway, both of which involve many key proteins abnormally expressed in apoptosis-related diseases, such as cancer. The majority of anti-cancer natural products promote apoptosis to induce cancer cell death. In this review, we aim to survey the current knowledge on key apoptotic proteins and some representative natural products that can induce cancer cell apoptosis by regulating these proteins. Method: We reviewed the recent relative literatures using a structured search of bibliographic databases, and the keywords, such as natural products, cancer therapy, and apoptosis pathway, were used for inclusion/exclusion criteria. Results: One hundred and seventy-one papers are included in this review. Numerous natural products have been reported to induce cell apoptosis by regulating the expression of key apoptotic proteins, leading to a variety of antitumor effects. 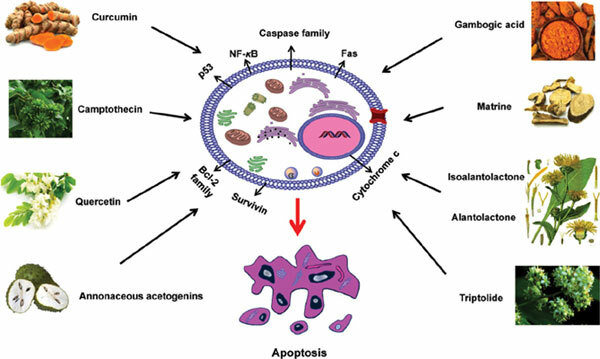 This review identifies the major apoptotic proteins and elaborates the interaction between the apoptotic proteins and various natural anti-cancer products. Conclusion: This review provides substantial evidences of apoptosis pathways in cancer cells and the apoptotic proteins modulated by active natural products, which may help to gain a comprehensive understanding for the development of natural drugs for better cancer treatment. Keywords: Natural products, programmed cell death, apoptosis-inducing, cancer therapy, apoptosis pathway, apoptotic protein. Keywords:Natural products, programmed cell death, apoptosis-inducing, cancer therapy, apoptosis pathway, apoptotic protein. Abstract:Background: Apoptosis is one of the pathways of programmed cell death (PCD), which leads to pathognomic cellular changes different from cellular necrosis. It includes the death receptor pathway and the mitochondrial pathway, both of which involve many key proteins abnormally expressed in apoptosis-related diseases, such as cancer. The majority of anti-cancer natural products promote apoptosis to induce cancer cell death. In this review, we aim to survey the current knowledge on key apoptotic proteins and some representative natural products that can induce cancer cell apoptosis by regulating these proteins. Postoperative Radiotherapy After Radical Prostatectomy: Adjuvant or Salvage?